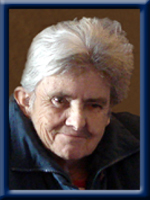 WHYNOT – Ida Mae, 65, of Liverpool, passed away peacefully in Queens General Hospital on Friday, October 11, 2013. Ida loved watching T.V. and playing scratch tickets, going for drives and walking with her husband Paul. She is survived by her husband of 31 years, Paul, her daughter Wanda (John) Montgomery of Milton, her son Donald Fisher of Alberta, her grandchildren Larissa and Tyler Montgomery, her great grandson Landon Montgomery, her sister Jean Chiasson of Liverpool. Paul and Family, my sincere condolences to all of you. We are so sorry for your loss. Our thoughts and Prayers goes out to you and your family. She is now an Angel watching over her love ones. we are sorry to hear of idas passing. our thoughts and prayers are with you all. Wanda and family so sorry to hear of your mom’s passing.I know you did all you could to make her last days here the best they could be and for that I know she was grateful.You’ll see your Mom again in a better place.God bless you all. through a lot since she had gotton sick and now she’s at peace. God be with you , at this time . through a lot since she had gotten sick and now she’s at peace. God Bless you all and now the angles are watching over her. Paul and family ,Sorry to hear about Ida.Our thoughts are with you and your family. sorry to hear about your Mom Wanda, Our thoughts and prayers are with you and your family. Wanda and family, our thoughts and prayers are with you. We know how difficult a time like this can be. Wanda, so sorry to hear about the passing of your mother. Our prayers and thoughts are with you and your family during this very difficult time. So sorry to hear about your mother.Find peace in knowing you were a wonderful and caring daughter to her.Take care! Paul and family,sorry to hear of Ida,s passing,take comfort in knowing she is now pain free and at peace,may god be with you at this sad time. I was so saddened to hear about your loss. Ida was a very special lady who will remain in my heart for a long time . I will miss her very much. God Bless you all. Dear Wanda and family. We are very sorry to hear about your Mom. Our thoughts are with all of you during this sad time.